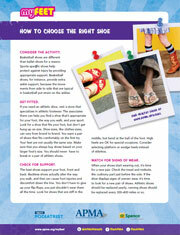 Click the image above to download the "How to Choose the Right Shoe" PDF to print and share. Basketball shoes are different than ballet shoes for a reason. Sports-specific shoes help protect against injury by providing appropriate support. Basketball shoes, for instance, provide extra ankle support, because the movements from side to side that are typical in basketball put strain on the ankles. If you need an athletic shoe, visit a store that specializes in athletic footwear. The associates there can help you find a shoe that's appropriate for your foot, the way you walk, and your sport. Look for a shoe that fits your foot, but don't get hung up on size. Shoe sizes, like clothes sizes, can vary from brand to brand. You want a pair of shoes that fits comfortably on the first try. Your feet are not usually the same size. Make sure that you always buy shoes based on your larger foot's size. You should never have to break-in a pair of athletic shoes. The best shoes support your foot, front and back. Backless shoes actually alter the way you walk, and that can cause foot injuries and discomfort down the line. You don't have to give up your flip-flops; you just shouldn't wear them all the time. Look for shoes that are stiff in the middle, but bend at the ball of the foot. High heels are OK for special occasions. Consider selecting platform or wedge heels instead of stilettos. When your shoes start wearing out, it's time for a new pair. Check the tread and midsole, the cushiony part just before the sole. If the shoe displays signs of uneven wear, it's time to look for a new pair of shoes. Athletic shoes should be replaced yearly; running shoes should be replaced every 300–400 miles or so. Want to find healthy shoe? Check out the latest list of APMA Seal Accepted footwear.